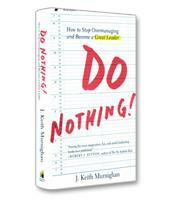 Do Nothing!’s practical strategies and true stories will show you how to set high expec­tations for your team and watch it rise to the challenge. It will help you establish a healthier culture by trusting people more than they expect to be trusted. And it will help you overcome your natural tendencies toward micromanagement so you can let people do their jobs—even when you know you could do their jobs better. In Do Nothing!, author J. Keith Murnighan, professor at the Kellogg School of Management at Northwestern University, makes the unusual argument that leaders are doing too much. By "doing," Murnighan is referring to overmanaging or micromanaging — taking on tasks that should not be covered by leaders. Overmanaging can undermine the confidence and autonomy of the members of a team. But most important, the author notes, when leaders are doing, they are not leading. Everyone has his or her job on the team; the job of an IT leader, for example, is not to take over programming, but rather to lead the programmers. "This is what great leaders do," writes Murnighan, summarizing his argument. "They don’t work; they facilitate and orchestrate. They think of great strategies and help other people implement them. They spend their time on achieving the foresight to be able to see new developments as or just before they happen... They don’t do anything — except think, make key decisions, and add a touch of organizational control to make sure the final recipes come out okay." Teams with leaders who focus on these kinds of activities, according to Murnighan, achieve their goals. Creating the environment that encourages, supports and is built on the expectation of superior performance is what leads to superior performance. How, then, does a leader create an environment of superior performance? The key starting point, according to Murnighan, is what he calls the "Leadership Law." When most leaders try to achieve anything, they start with their own actions. The Leadership Law proposes a different approach: "Think of the reaction that you want first, then determine the actions you can take to maximize the chances that those reactions will actually happen." To put it another way, Murnighan writes, "what is more important: your actions as a leader, or your team’s reaction to your actions?" Leaders tend to be focused on their actions. They communicate what they want to communicate, to take a simple example; instead, they should first figure out what reaction they hope to elicit from a communication and then design the communication based on that reaction. This approach leads to some important principles of leadership: focus on them (not you); take their perspective; listen actively; and "get on the balcony/walk the floor." This last principle involves leaders being close enough to the action to understand what is happening (walking the floor), but at the same time putting some mental distance between the action and themselves to give themselves some perspective (get on the balcony). All of this is accomplished without driving a wedge between the leader and his or her team. Do Nothing! is not a theoretical book on leadership, but rather a practical guide for leaders, many who would like nothing more than to focus on high-level leadership priorities without worrying that the team is reaching its performance goals and achieving or surpassing the expected results. For example, one chapter, titled "Release Control (Deviously)," recognizes that leaders feel that since they are responsible, they must be in control to ensure success. Murnighan argues, however, that controlling leadership leads to unmotivated employees and poor results. He urges leaders to promote democracy in their teams and create a "psychologically safe" environment in which team members are not afraid to share their opinions. At the same time, however, Murnighan describes some "devious" or subtle ways to have some control. Do Nothing! covers a number of other practical leadership strategies intended to help leaders do less and lead more. Instead of focusing on performance goals, for example, leaders should develop a vigorous learning mind-set in the organization — performance will follow. Instead of focusing on profit making, leaders should embody strong core values — profits will follow. Each prescription in the book is illustrated through real-life examples. The book ends with the stories of seven leaders, from the well-known to the obscure, who illustrate the principles of the book. Do Nothing! will be welcomed by any leader or manager frustrated by his or her efforts to combat understaffing with an increase in personal workload. To receive more reviews and full, in-depth summaries of top business books, plus audio and video interviews with top authors, subscribe to Soundview Executive Book Summaries.